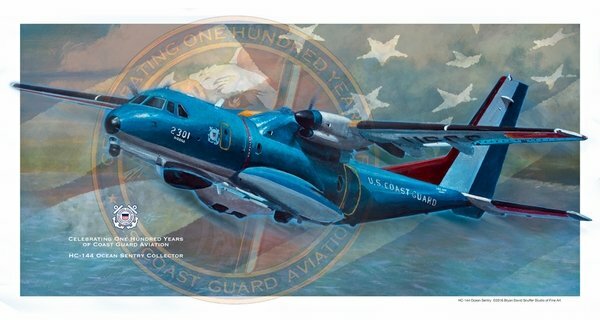 "100 Years HC-144 Ocean Sentry Collector"
If you want to obtain your slice of history then this Ocean Sentr Collector print for the 100 Years of Coast Guard Aviation is for you. A limited edition 16x30" of only 100 giclee' prints. Each is signed by the artist. Shipped in a tube. Click on the image above for a larger representation. The HC-144A Ocean Sentry plays a pivotal role in the modern Coast Guard Aviation Search and Rescue. The aircraft in the print has been assigned to ATC Mobile and painted in the colors to celebrate the Centennial of Coast Guard Aviation.